Kanga Motorsports is excited to announce our new partner FreeM USA. FreeM offers the highest quality racing safety gear. FreeM USA is the official race suit supplier for Kanga Motorsports. James Chartres will be wearing the iconic blue Kangaroo on his bespoke FreeM USA racing suit, competing in the #77 Spec Racer Ford within the San Francisco Region of SCCA. FreeM creates bespoke Italian racewear, teamwear and leisurewear of the highest standard in quality, backed by our one on one service that is second to none. FreeM specializes in the custom tailoring of race suits, gloves and shoes so that you and your team look and feel fantastic. 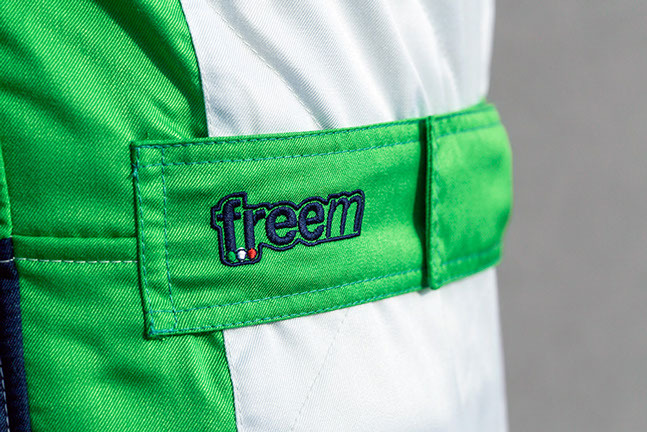 FreeM has enjoyed dressing some of the world’s most famous motorsport & karting marques, drivers and teams relying on a transmission of skills, craftsmanship and passion. Working directly with drivers and teams ensuring a more personable and reliable service with warranted production schedule and satisfaction.